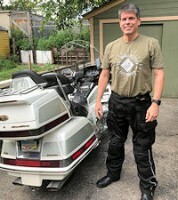 Hello riders, I have a new to me 2000 goldwing .I think I'm really going to enjoy riding now without vibrating.I have been using a Keck jack for years on the harleys.It's a two arm jack that lifts about knee high.I noticed on the goldwing two pipes with metal covers one on each side of the engine. Will lifting up the motorcycle on these bend or break anything or should just the engine be touching the jack arms.Opinions and experienced advise welcome. Those pipes are exhausts running from the front cylinders. Do not lift the bike using them, they will collapse, and they are difficult and expensive to replace. I cut a piece of plywood that fits neatly in between those pipes, up against the bottom of the engine. I then put the jack on this and lift the bike this way, so the weight is on the engine base, not on the exhaust pipes. Yes, like Admin does it, otherwise you will end up with an exhaust leak from the copper o-ring seals, where the exhaust headers meet the exhaust ports! Thanks wingadmin and dusty. Ride safe and often.